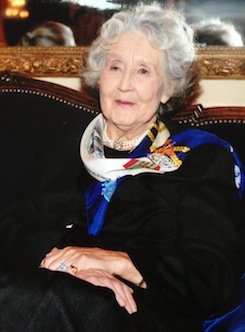 Noreen Riols was born in Malta where her father was serving in the Royal Navy, and educated at the French Lycée in London. From 1943-45 she served in SOE (Churchill's Secret Army) and post-war worked for the World Service of the BBC where she met her journalist husband, recently demobilised from the 1st French Army. After 6 months behind the Iron Curtain in Bucharest in the early fifties, they settled in Versailles where their five children were raised. For nine years she worked freelance from Paris for "Woman's Hour" while writing for many newspapers and magazines and MacMillan has just bought her eleventh book: "They shall not grow old". Noreen Riols’ new novel Autumn Sonata has had a great review from the Society of Women Writers and Journalists. 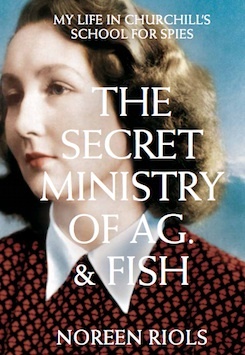 Noreen Riols, author of The Secret Ministry of Ag. & Fish, discussed her career as a wartime spy in the Daily Mail last week. Noreen’s new novel Autumn Sonata is out now. Noreen Riols has been making friends in high places, on a visit to Tempsford to unveil a memorial to the female secret agents of the Second World War. There is a powerful video to mark the 2013 SOE memorial ceremony at Valencay, France, featuring agency author Noreen Riols.